Rubato is a “Real-Time” app that teaches the critical executive functioning skill of time management. Just like Robin Hood, rubato allows one to “steal” from one segment of your schedule and "give" to another. Rubato’s easy clock face user interface makes for fast organizing of one’s time; multiple segments can be arranged, re-arranged and organized easily and intuitively. Rubato+ allows users to create multiple clock faces, save them in folders and link them to create multiple hour-long scenarios. They say: “Time waits for no one”; but by keeping track of your use of time and allowing you to trade time between the things you need to do and the things you want to do, rubato helps teach time management by visually reinforcing real-time concepts. 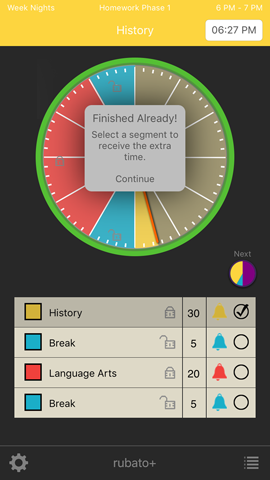 When time expires from one segment, rubato asks from which other segment you may wish to borrow time and then visually adjusts the display to reflect your choice. Rubato’s interactivity makes you a real-time participant in the management of your schedule at home, at school, at work and at play. Please select an essay from the list to the left—and enjoy mastering time with rubato.